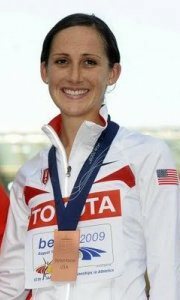 Shannon Rowbury was a member of the 2008 United States Olympic team which competed in Beijing, China and both the 2009 and 2011 U.S. World Championship teams in the 1,500 meters. She earned the 2009 World Championships Bronze Medal and finished in seventh place in the 2008 Olympics. Shannon was champion in the 1,500 meters at the 2008 Olympic Trials and 2009 USA Track and Field Outdoor Championships. She also won the 2008 USATF Indoor 3,000 meters. On the roads Shannon won the 2009 and 2010 Fifth Avenue Mile after finishing as runner up in 2008. She competed for Duke University and is a six-time All-American. Shannon was the 2007 NCAA mile champion, NCAA two-time runner up (mile and 3,000 meters) and six-time ACC Champion (mile, 1,500 meters, 3,000 meters and cross country). Rowbury was the National 800 meter champion and two-time California State High School champion (800 meters and 1,600 meters) at San Francisco’s Sacred Heart Cathedral Preparatory. Her personal best times include: 800m – 2:00.47; 1,500m – 4:00.33; mile – 4:20.34; 3,000m – 8:31.38; 3,000m steeple – 9:59.4 and 5,000m – 15:00.51. Shannon has been inducted into the San Francisco Prep Hall of Fame and Sacramento Meet of Champions Hall of Fame. She earned two degrees from Duke University, a Masters in Humanities in Film Studies and Women’s Studies in 2008 and a Bachelor of Arts in English and Theater in 2006. Shannon resides in her hometown of San Francisco, California. GCR: You are coming off of your first racing season as a professional runner in 2011 that didn’t result in your usual fast times and high places due to your recovery from an injury. How do you assess your 2011 season, how did your training go over the winter and early spring and are you progressing toward being in top form for the 2012 Olympic Trials? SR Last year was tough as I had a series of Achilles tendon injuries – first my right and then my left. It started in the fall of 2010 when I was doing my off-season training. When the first one started getting better the other tendon began flaring up. I made the World Championships team in 2011 off of about six weeks of real training. I was able then to train through the summer and hoped to make the final at Worlds. I didn’t quite make that goal but I was able to come out of the season with the Olympic ‘A’ standard and came out of it healthy. So this year training has been going great, knock on wood. I’ve had a good progression with fall base training as I went to altitude in Mexico for three months. I’ve gone to Mexico for altitude training for the past four years but always for shorter periods of time. We decided that since I respond well to that type of stimulus that I should go for a little bit longer. The past two months I’ve been at sea level getting in more sharpening work and transitioning to the track. I did two indoor races that went pretty well and have done a couple low-key 800s to work on my weaknesses. GCR: After those low-key 800s your first major race this year was when you stepped up in distance and ran the 5,000 meters at the Peyton Jordan Invitational. It started off well, but what happened that caused you to abort the race? SR It was disappointing for me as I had hoped to run quickly, but maybe I was a bit overambitious with my planned pace since it was my first big race of the season. For the first 3,000 meters I was on fifteen minute 5k pace which was the pace I wanted. My goal was to hit that pace through 3k and then to maintain or pick up the pace from there. Then I started feeling pretty dead, went through 4,000 meters but was running slow splits and decided it didn’t make sense to finish because the time wasn’t going to be good and I might hurt myself in the process. GCR: At the USATF Occidental Meet you raced the 1,500 meters and, as I watched via the internet, you looked very much in control, in command and it appeared that you moved when you wanted to en route to a victory over a fast-closing Anna Willard. How were you feeling as you were racing? SR That was how it felt and it’s always nice to have that feeling when racing. My training had been going well and since I already had the Olympic 1,500 meter ‘A’ standard time I just wanted to see how I could run in the second half of the race. So I took it out pretty easy, kept building during the second lap and was pleased I could pour it on in the last lap. It was nice to come back in the 1,500 meters which I am more familiar with running and to have a good finish. GCR: What are your upcoming race plans before the Olympic Trials and do they include this weekend’s Prefontaine Classic and the Adidas Classic in New York? SR I will be racing the 1,500 meters at Pre and the Adidas Classic is up in the air as I am still waiting to see if I get into the 800 meters at that meet. Hopefully I’ll get in one more 800 to work on my speed – if not in New York, then there are a lot of meets and I’m sure I can find one somewhere. GCR: We’re less than a month out from the Olympic Trials – do you have any soreness or minor injuries limiting your training or are you on course to be at your best? SR Fortunately I am healthy and, knock on wood, hope to stay so. I’m hoping to continue to progress and get sharper as we get closer to the Trials and that seems to be the case so far. Everything has been going well. GCR: It’s often said that we learn more from tough times when things don’t go as hoped for versus our successes. What did you learn from your 2011 racing season and recovery from injury that is benefitting you in training and will help you with your racing? 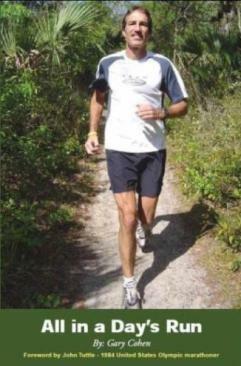 SR I think more than anything it was a mental lesson for me because in the moment when I was trying to get back into shape I had a realization of just how fit I had been in the past. Before in training I would get fit and not have a real understanding of what it meant as far as my fitness. But when I got injured and was trying to get fit again I realized that I was in good shape in the past though I didn’t realize it, own it and race with the confidence that I should have. So coming out of the injury I have a new appreciation for the fitness I am capable of and also a sense of pride that I was able to make the World Championship team against a stacked field as middle distance in the United States has come a long ways in the past four years. Making the Worlds team with limited training was one of my proudest moments. That also gives me lots of confidence as I was able to make a team far from my peak fitness. It makes me excited for this year since my training is going well and my fitness is good. I’m excited to see what I am capable of. GCR: What have your indoor and outdoor track races so far this year indicated for you and your coach as you determine necessary areas of focus in training? SR In the past in the 1,500 meters I have found that I am very strong. I have speed but the best type of race for me is when there is a fast pace throughout and even splits. I’m capable of going out at my goal pace the entire race and am capable of making it through three rounds because of my strength. At some of the Diamond League races where it goes out slower and then runners have a blazing kick the last 200 meters I am not as fast as some of the other runners so that isn’t my ideal race scenario. Working on that speed development through actual running training and things in the weight room and things we emphasize in practice, doing low-key 800s so I can get used to that race again so I can improve my PR there. We are also focusing on my strength and trying to maximize them. GCR: You are one of over a half dozen American women including Morgan Uceny, Jenny Simpson, Anna Willard, Erin Donahue, Jordan Hasey, Sara Hall, Molly Huddle and Christin Wurth who are contending for three spots on the U.S. Olympic team at 1,500 meters. How difficult will it be just to make the U.S. Olympic team? SR It will be very difficult to make the U.S. Olympic team and particularly in the 1,500 meters. It’s a distance where championship races tend to be tactical and almost everyone can be in the race until the last lap. If something goes wrong there isn’t much room for error. To make the Olympic team is going to be very challenging and those who do so will have to be very fit, stay on their feet, get to the final and race well tactically. A faster race is good for me and I’ll always take a faster race when I can, but I am working on my speed to prepare myself for any situation. It will be a challenge, but for me I am glad I have all of these years under my belt as at the championship level it isn’t just about fitness, but about mental toughness. GCR: Do you feel that your best times of two minutes flat for 800 meters and 15 minutes flat for 5,000 meters gives you an optimal combination of speed for a final kick and strength to aid in running the three rounds of competition at the Olympic Trials and on the world stage at the Olympics and World Championships? SR I think I have really good components to keep working on the top-end speed and to race with the confidence and understanding what my training means. It’s also one of these things where each year I find new ways to stimulate my fitness and get better. For me it is always exciting when I find a new challenge and a way to improve a weakness and to get that much better. GCR: What are the primary advantages you have as a professional runner compared to your college days that help you in the areas of your health and general fitness that allow you to train and race at a higher level? SR I was fortunate that I started with good physiological care and treatment from an early age. Since I lived in San Francisco where there was a large athletic community I started using the care of a chiropractor, massage therapist and acupuncturist when I was about 13 years old. While I didn’t see them much when I was younger, establishing that network was helpful to ensure that I had minimal injuries throughout my career. Other than that Achilles tendon injury last year my only injury was a stress fracture, which was a significant injury, but I was fortunate to go eight or nine years without an injury and to build my base. Now that I am out of college and back in San Francisco I have that network on which I can rely on a regular basis. The other great thing about being a professional athlete is that I can plan my day around my training. If I have double workouts I can get up early, but not too early, get in my morning session and have time to eat, nap and run again. If I only have one training session scheduled on a certain day I have the luxury of sleeping in if I need extra recovery or going for massage in the middle of the day. If I was working or in college I would still do the training, but as a professional athlete I can put higher emphasis on recovery and making sure I get through each day with the best training possible. GCR: Since most of the high level track and field competitions are held in Europe, what do you do as far as living facilities, nutrition, training partners and travel to make it as comfortable as possible and to ensure you race your best? SR It’s been a learning process to figure out what works best for me. The first year I competed as a professional runner I was super excited to go to Europe because I love to travel. But then I was in Germany and didn’t know the language so I was a little bit overwhelmed. Since that year I’ve realized that I do my best when I have a home base where I can unpack my bag, cook meals and travel in and out of there for races. So I go to Europe at the beginning of the summer around July and stay there for the duration of the season through September. Some athletes I know will fly back and forth to their home in the U.S. a couple times, but I do much better if I get into a good routine, adjust to the time change and focus on where I am. GCR: Running isn’t only your sport, but it is also your job. What do you do when you go through low periods in training, how do you keep it fun and how do you maintain your passion? SR That was something that hit home last year when I had my injury and I had to make sure that I had balance in my life. In college academics were very important to me as I studied theater and film and had a creative outlet. Now that I’m running professionally I helped found a group called the Bay Area Track Club which has an emphasis on supporting elite and emerging elite athletes along with community involvement. We do youth clinics and have camps at some local schools to teach kids about fitness and running. So community involvement has helped me to not just focus on me and my performances and what I do on the track. Also it is important to find ways to create balance during the year by having a relaxed and low-key fall season and letting the summer be intense when I am racing. Additionally, I will aim for balance during a week by having intense training days and then days where I sleep in and can go to a museum. I’m constantly trying to find mental and physical balance that makes my life not be exclusively about training and running, but that also doesn’t do anything outside of running that will deter from my running performance. GCR: A highlight of your running career has to be your winning the Bronze Medal at 1,500 meters in the 2009 World Championships. Was this a dream come true and how exciting was it to be on the podium and to receive your medal? SR It was very surreal – the whole experience. It had been very chaotic leading up to it as there had been a disqualification so I didn’t get to take the fun victory lap with the American flag. Rather I had the nervous waiting on the warm up field to see what the judges would determine was the outcome of the race. While I wish there hadn’t been a disqualification, I was ecstatic that I was and am a Bronze medalist. It was only my second year as a professional athlete and it still felt new to me. If you had asked me I would have said, ‘Oh yea, I want to try and medal’ but I don’t know if going into the race think I really had a clue what that meant and how monumental it would be in my life. Now, three years later I have a greater appreciation for what it meant. It is a pride that is a slow burning one and being in the Berlin Olympic Stadium made it even more special. GCR: That race did have some controversy as Ethiopia’s Gelete Burka was fouled and knocked to the track on the last back stretch by Spain’s Natalia Rodriguez resulting in Burka finishing back in the pack and Rodriguez being disqualified. What are you memories of your race strategy, the situation with Burka and Rodriguez and your strong finish? SR Before the fall we were on the last lap, we started to separate and I was excited as I was feeling good. In the Olympics the previous year I was in great position and when the leaders moved with 350 meters to go I just couldn’t go with them as I didn’t have it I me. But this time it was great because I was right with the lead pack of four or five, we were together and I was going right with the pace. Then with 200 meters to go all of a sudden there was a body in front of me on the track. I was grateful for my dance training and all my years of racing as I was quick on my feet and kind of reacted. I just got around her and kept on moving. GCR: You were involved in a fall in your preliminary heat as you were tripped, got up quickly and caught the pack, got cut off again and initially did not qualify for the semi-finals as you finished in 11th place. How unnerving was it when you waited for results of the U.S. appeal on your behalf and how relived were you when you were advanced to the semi-finals? SR When the race finished I was devastated and was in shock when I walked off of the track. I was thinking, ‘I just didn’t move on.’ The U.S. team representatives told me to stay there as they had already lodged a protest. They asked me to tell them my recollection of what happened so that they could share my thoughts with the Olympic officials. I didn’t know how the whole protest situation worked but I am grateful that there are procedures to deal with these types of situations. From my perspective I was elbowed a few times, then I was tripped and fell and when I got back up to some runners I was elbowed some more all by the same person so something didn’t feel right. When I got word I was advanced to the semi-finals through the appeal process I was still devastated as I didn’t envision it happening this way. I wanted to earn my spot as every athlete does. I remember getting into the ice bath even after I had been advanced and just sobbing because I was upset with how everything had turned out. But I think it made me appreciate what I was trying to do and it made me tougher. When I went into the next two rounds I had a feeling that I wasn’t taking anything for granted. GCR: In 2008 you qualified for the Beijing Olympics by winning the Olympic Trials 1,500 meters. How exciting was it to make the team and to represent the United States? SR Oh my gosh – it was amazing! I was ecstatic and very proud. My family has been so supportive every step of the way so it was very special to be able to share that with them. Being an Olympian is something that I have appreciated even more as the years go by as I realize how difficult it is to make the team and what it means to be a part of the group of Olympians. GCR: Did you adjust well to the huge difference in time zones and to training at the U.S. training camp? SR It was tough as I had a very clear sense of what I needed to do to make the team but didn’t know what to expect once we got to Beijing. It was a little difficult to adjust to the time zone difference. I was a bit overwhelmed to be in such a big city at a big event. I did the best I could to get into a routine and to settle in. I’ve learned how to adjust better since then and hopefully if I make the team for London I can use the tricks I learned along the way to settle in, let go and enjoy the experience for what it is. GCR: Your seventh place in the 1,500 meter final was an excellent showing in your first Olympic Games. How did you handle the rounds, were you pleased with your race and is there anything you could have done differently that may have put you in contention for a medal? SR I think I didn’t have it in me to place in the medals as much as I hate to say that and as much as I wish it were different. I couldn’t have had the race unfold any better for me as I was exactly where I wanted to be and in perfect position with 500 meters to go. I started to go with the other runners but with about 350 meters to go the gap started forming. I’m not too disappointed about the race though I wish my fitness had been better so I could have capitalized on the moment. But I did everything that I could and there is nothing that could have changed. I had given so much mental and physical energy to making the team and was probably in my best shape of the season for the Olympic Trials. I still ran well after the Olympics and had good races but I was emotionally exhausted and getting a little tired physically as well. GCR: Did you attend the opening and closing ceremonies and do much travelling in China after you finished competing? SR I did go to the opening ceremonies as that was one thing I really wanted to do and was grateful for that opportunity. I didn’t attend the closing ceremonies and I didn’t get to travel very much. My final race was on the last day of competition so most of my Olympic experience was spent in the village trying to pretend like it was any other day in San Francisco and I was going about my business. Each day more and more athletes were finished competing and going out in their party clothes. I was trying to have tunnel vision for my event and was pretty jealous of everyone who was done. But I also kept it in perspective as to how grateful I was to be at the Olympics and in the Olympic final. GCR: How exciting was it to have your high school coach, family members and friends at the Beijing Olympics to watch you compete and to share the Olympic experience? SR It’s sort of crazy to me that I have been able to share these monumental experiences with those who are closest to me. Part of it is funny because when I’m on the track it feels like I could be anywhere and I had to remind myself that I was in Beijing and not back in San Francisco training at a local high school. It was nice to have people from home with me as it helped keep a sense of normalcy and familiarity when I was in a place that was so different. SR It was great as my high school coach and I are still close and he has been very helpful with my dealing with the mental side of running. He helps me ensure I am prepared for major competitions in many ways. He and his wife are very kind and supportive and it was special to be able to share big moments. What make those big moments so special is sharing them with others, talking about them and being able to reminisce. They share the side of spectators and I relate the side of the athlete and it makes the experience that much more complete. GCR: Let’s go back to your beginning running as a freshman in high school and go through your progression through your college years. How fortunate were you to have Andy Chan as your coach and how did the two of you grow together since your first year running was also his first year coaching? SR I started running on a whim and he had started coaching at my high school that year so it was almost like it was meant to be. Because I had done dancing as a youth it took me a long time to dig in with running. It was something that seemed one dimensional compared to dancing where I had to memorize routines and get on stage in costume to perform. It took me a while to appreciate all of the amazing things that running has to offer. Andy was good as he allowed me to evolve into running as did my college coach. I think they recognized that I had potential but that I was an athlete who needed to be eased into it. They both did a great job of creating a good foundation so that I could grow. One of the signs of a great high school coach is one who prepares you to be a good college runner and one of the signs of a god college coach is one who can instill in his athletes a passion for running that they still have when they complete college. Andy was the first to set me on that path. GCR: How did the physical nature, competitiveness and repeated sprinting you did as a youth soccer player and the structure and discipline of your Irish dancing contribute to your quick success as a runner? SR They were really important in my having success quickly. Dancing had helped me to develop a strong core and coordination along with fast-twitch muscles and foot and ankle coordination. It created a good foundation. Soccer gave me the confidence that I could run. My soccer coach was always saying, ‘You are really fast!’ It gave me a joy of running which I hadn’t experienced before. I was very fortunate to have that background. GCR: Was it surprising to you to start as a junior varsity cross country runner as a freshman and end the season as league champion and then to win the Central Coast Section 800 meters in 2:13.3 during track season? SR It was one of those things where I was competitive and wanted to be the best that I could. I had no idea about running when I started and none of my family members were runners so I just relied on Andy to give me strategy and I would try to follow his plan. Winning these big races as a freshman was sort of surreal as I was thinking ‘Okay, wow!’ I didn’t appreciate my ability and talent level until my junior year. It came so easily at first that when I was in the process of trying to succeed again I realized it wasn’t easy and was a challenge, so my appreciation grew. GCR: What was your training mileage early in your high school career and did it increase much over the next three years? What were your ‘bread-and-butter’ sessions for stamina, speed and racing final kick? SR In high school I mostly raced the 800 meters and was training for dancing year around so my mileage was never very high. I don’t know what it was as a freshman, but by my senior year I averaged about 35 miles per week and may have got over 40 miles in a week a few times. In my entire high school career my long run was 11 miles which I only did twice during those four years. I definitely was a lower mileage runner. When we were getting close to the State meet for the 800 meters we would do a 300 meters workout where we did two sets of three 300s with a 100 meter walk in between. Coach Chan would tell me this was the important workout to tell us I was ready for State. I don’t remember my times and didn’t really understand what the times meant, but if he said they were good then it must have meant that I was ready. GCR: During your junior year you moved to a high level with a second place in the state cross country meet and victories at 800 meters at the Arcadia Invitational and at the State meet. What are some of the highlights of these three races as far as your strategy, tough opponents and in the last two races what factors led to your wins? SR Winning at Arcadia and especially with a 2:08 was a shock as it was the leading time in the nation for my age group. I had a really good kick and I was excited that I won. Everyone around me was so excited. Then when I went to State I was really nervous. Since I ran so well at Arcadia there were expectations that I had. 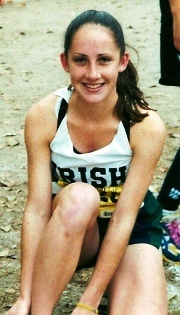 I was going for my first State title - I had just missed in cross country as I couldn’t quite kick with the girl who won. I was super nervous at State, but very excited with the win. After that I remember going to the national meet and winning that seemed almost easy in comparison. I say that because in California you have to go through all of these rounds just to make it to State and then at State there are trials and finals on back-to-back days. Also, the depth of competition is so great. The competition at Nationals was good, but it was easy in comparison. Now I did barely win that race, so it wasn’t like it was easy, but once I accomplished the goal of being a State Champion I was much more relaxed and confident. GCR: How hard was it balancing racing and recruiting your senior year of cross country and what led you to signing to go to Duke? SR The college decision process went pretty smoothly thanks mostly to my mom. She organized a trip so that after the National meet in Raleigh, North Carolina after my junior year we took a ten-day trip up the East coast. My mom, dad and I looked at about ten different schools starting in North Carolina and ending in Boston. We looked at the schools and met with coaches from schools that were big, small, Division One, D3, public, private and just a whole array that my mom created. It was very helpful for me to see what the schools were like and to meet the coaches. From there I narrowed it down. I was allowed five official visits, but only took three to Duke, Boston College and Villanova. It came down to Duke and Boston College and I had a hard time making a decision. I really liked Coach Kevin Jermyn’s philosophy at Duke and the academics were very enticing as were Duke’s facilities. Boston College, unfortunately, didn’t have a track. After going to a high school without a track I really didn’t want to deal with that again. So, all of those factors led me to Duke. GCR: In your final prep track season you decided not to defend your state title at 800 meters and raced 1,600 meters which you won. What was the decision process that led to your switching events at state and what major moves contributed to that victory? SR Since my freshman year I had been running the 800 meters because in that year Andy thought that was where I had the best shot of making it to State. Then I kind of just stuck with that event. By the time I got to my senior year track season I had three and a half years of running under my belt and had done some 3,200 meter track races where I had good performances. So Andy thought it was a natural progression to race the 1,600 meters at State. During the course of the season I raced from the 4x400 meter relay up to 3,200 meters so I had no fear of racing at different distances. I trusted Andy’s input as he looked at my training and fitness level along with the competitive field. He thought we should focus on 1,600 meters during my senior year since I would most likely be moving up to 1,500 meters in college. In the State race I was with the pack, but near the front, until 200 meters to go. Then I took off the final 200 meters and ran to victory. GCR: How smooth was the transition to being coached by Kevin Jermyn at Duke and what were the primary contributions he made to your mental and physical success as a runner? SR I credit Kevin for planting the seed of professional running in my brain. During college I was focused on getting through the day-to-day challenges of balancing academics and athletic training. I didn’t even know that professional running existed, there was a world where I could possibly get paid to continue running after college and that I was good enough to do so. He got me thinking about it when I was a junior. So my senior year we redshirted indoor and outdoor season and I competed at the U.S. Championships and one of the Golden League races in Los Angeles. I started thinking, ‘This is cool, this is fun, and I could see myself doing this after college.’ So I’m grateful to Kevin for that and for thinking about me in the long term. When I came in as a freshman he had a plan that would get my ready to contend for and to win NCAA titles as a junior or senior rather than push me to the breaking point right away. He helped developed me as an athlete rather than using me up and throwing me aside. GCR: In cross country you were an individual ACC Conference champ and your team placed in the top three at the NCAA Championships. Compare and contrast the joy of individual and team success in cross country. SR Having the team success was more fun in a sense because it was shared by everybody. I’m really proud of my accomplishments as an individual but I’m not someone who likes to talk about them too much. However, the team success is fun as I can talk about what we did together, talk about experiences with each other and it is cool to be able to share that with others. Some people have no problem talking about themselves all day long, what they want to do and strutting their stuff, but if you have a shred of humility you can’t walk around saying things like ‘I am the greatest!’ It is much more fun to help your teammates to run faster intervals in workouts or to reminisce about the great race when your team won. I found that I got more out of workouts when I was encouraging others as it helped me to work harder. In an environment where there is excitement and energy it is contagious. So there is something special about shared experiences. GCR: While at Duke you won six ACC titles. How exciting was it to compete at the conference level as you prepared for the NCAA Championships? SR The ACC Conference was an extremely high level of conference competition when I was racing. There were runners like Shalane Flanagan, Alice Schmidt, Erin Donaghue, Nikia Green, Annie Bersagel, Julia Lucas, Brie Felnagle and more people than I can remember off the top of my head. There was always someone I was battling with and to place well in the ACC you had to be on your game. If you won an ACC Conference title it meant that you were one of the best in the nation. I always appreciated that starting back in high school where section competition was tough before State so it set the stage for me to continue to rise to my level of competition. I’d rather face good competition, get the most out of me and to have that win mean something than to compete against no one and win easily. GCR: You won the NCAA Indoor mile your senior season and then your collegiate career ended due to an injury. How rewarding was it to win that NCAA title and how disappointing to have ‘unfinished business’ since you couldn’t race outdoors? SR The indoor nationals was probably my shining moment up until that point as I won the mile and then an hour and a half later I came back in the 3,000 meters and barely was beaten as I got second behind Sally Kipyego. It seemed that the sky was the limit and I was very excited about the upcoming outdoor season, its possibilities and running beyond college. So to have that stress fracture which was my first injury was very disappointing. I didn’t know what to make of it at first because the injury didn’t happen immediately. It was a slow growing feeling of pain in my hip and it wasn’t until maybe four weeks after that it got to the point that I couldn’t run. Then it was another two weeks before my parents flew me home and I saw my doctor in San Francisco because I just wasn’t getting what we thought was the complete treatment I needed in North Carolina. It was such a struggle and so disappointing to go from a high and to watch it fall apart. But once I had the diagnosis it was almost a relief. I talked to some other athletes and we discussed how sometimes when there is an injury we question whether we are being a wimp or making a bigger deal out of it than we should. There is a feeling that there is something we haven’t done to make it miraculously better. When I received the MRI results they showed I had a stress fracture and the first thing prescribed was that I had to take six weeks off from running. It was a relief as I had been fighting an uphill battle for many weeks and now I knew the problem and that I could rest to fix it. GCR: You selected Coach John Cook to help you with your rehabilitation and he continues to coach you. What did Coach Cook do in those early months to help you and what continues to be his major contributions to your success as a professional runner? SR What’s great with Coach Cook is that we had been communicating a bit and he had sent me a text message wishing me good luck at the outdoor ACC meet which is around when I went home to figure out what was wrong with my hip. I responded that I wasn’t racing and was hurt. Without any ties between us he gave me suggestions of people to see in his network and he tried to help me out. I was so grateful that this man I hardly knew was taking time and energy to help me. We kept communicating and he was very supportive. Even after the stress fracture diagnosis he wasn’t deterred from working with me. Our relationship evolved and we decided to work together. He put me in touch with Dan Pfaff who helped me to get stronger by doing exercises with proper form so help prevent future injuries. One of the best things about Coach Cook is the network of people he knows and the dedication to his athletes. He can be a pit bull when he wants to be and I’d hate to be on the opposing team, but when he is on your side he will go above and beyond to help those he cares for. GCR: What is your base training mileage now and has Coach Cook added some different training elements compared to Coaches Jermyn and Chan that have enhanced your success? SR I’ve always taken a gradual approach to increasing mileage. I started my freshman year in college at about 50 miles a week and Coach Jermyn increased my mileage to a maximum of about 60 to 65 miles per week by my senior year. Now my peak is about 80 miles though I tend to average about 65 to 75 miles per week when I’m doing my altitude base training. With my dancing background I was introduced to a lot of different exercises and in college Kevin incorporated dynamic warm ups and hurdle drills. Then Coach Cook took many things I was familiar with and structured them into routines which had a specific thought-out order. GCR: Right out of the box in 2008 you lowered your 1,500 meter best from 4:12.31 in college to 4:07.59 at the Peyton Jordan Invitational and then by an amazing six more seconds with a 4:01.61 at the Adidas Classic. Had your training indicated you were ready to go a lot faster or did these two big drops in your PR surprise you and Coach Cook? SR It was kind of a shock, not just to the world, but I was included. Looking back on the training at that time it was going well and I had lowered my PR in the 800 meters by four seconds. My workouts were all good but I didn’t have a good sense of what they all meant. Now that I have more of a sense I know that the training was great. The difference was that in college Kevin Jermyn trains many of his runners like 5,000 meter runners so I ran the 1,500 meters and mile, but my 5,000 meter oriented training made me a strength middle distance runner. With Coach Cook we started emphasizing more speed and adding that component back that I had gotten away from somewhat since high school which enabled me to get a big PR at 1,500 meters. GCR: In 2008 through 2010 you placed right at the front of New York’s Fifth Avenue Mile with a second place followed by two victories. What are similarities and differences of racing a mile on the road rather than the track and why are you so successful on the road? SR Part of my success is that since I am a strong runner I can race well at the end of the season when that race is contested. Also, because of my strength the 3,000 meters is probably an ideal distance for me as it combines speed and strength The extra 110 meters from 1,500 meters to the mile is good for me and the way I am built I can use the slight downhill to my advantage and get good momentum during the race. GCR: You have had so many great races and competitions in the past several years in the U.S. and abroad. Do any of them jump to the forefront of your thoughts because of your tactics, a big kick or other factors? SR My best race in Europe was my first Golden League race in Paris. Jamal and Burka were in the lead and were battling each other while I was kind of hanging out in third place. We hit the last lap and Jamal and Burka started moving faster. Then Burka was dying a little bit and it was down to Jamal and me. When I was coming down the finishing stretch I wasn’t too far behind Jamal and I ended up with a 4:00 time which was exciting. It was a nice venue and lots of fun. SR I can’t think of a specific person in particular but I appreciate having someone to push me. It seems like every season there is someone different who steps it up and it is nice having someone like that as I know I better bring my ‘A’ game which is a good thing. The top runners all have their different personalities but I respect the athletes out there because I know the training they all put in. There is a mutual respect and though we all want to beat each other we appreciate each other’s efforts. GCR: As I noted earlier with the depth of the 1,500 meter women in the U.S., there is resurgence in U.S. men’s and women’s middle distance and distance running though we aren’t seeing Olympic Medalists and number one World rankings as in the 1960s and 1970s. Do you think a recent campaign to bring back the mile in competition rather than the high school 1,600 meters and collegiate 1,500 meters would attract more of our youth to running and stir more public interest? SR I do think it would be nice within the U.S. There is a lot of potential and it is under-recognized. I think we need to find a new way to reach the public. I can’t tell you how many times that I tell someone I’m a runner and before they even know my event they ask about my time in the mile. Fortunately for me I have a good mile time that is fun to share because that is my event. Running is something that almost everyone has done at some point in their life because they have all had P.E. class and the mile is something that everyone understands. If there were more races like road miles and events in different places where people could come and watch, it would help increase awareness of running and track and field. GCR: Many athletes come from families where much is expected and encouragement is abundant. How did your upbringing form your character and make you the woman you are today? SR My family’s support was huge. I am extremely grateful and very lucky. They set the foundation for me to work hard and do things that I’m passionate about and can focus on. GCR: You excelled in the classroom as well as in your athletic pursuits. How important was it to you to have that balance in your life? SR It was very important for me. When I looked at colleges I wanted a school that had a strong running program, but I also desired a place where I could get a good education because it’s important for me to develop as a well-rounded person. When you have a profession as I do that is physical in nature, at some point it will end so there must be someplace to go afterwards. GCR: Some top middle distance runners have moved up in distance and been very successful at 5,000 meters. With your success already at 5,000 meters do you see an equal focus on 1,500 and 5,000 meters in the next few years with the possibility of moving up exclusively to 5,000 meters during the next five years? SR I’m open to that. I think it is important to develop in multiple events. As I get stronger and have more years and more mileage on my legs I will keep my options open. I think I have a lot of potential in the 5,000 meters so I’m excited to see what I can do in that event as well. GCR: Your personal best times are 2:00.47 for 800 meters, 4:00.33 for 1,500 meters and 15:00.51 for 5,000 meters. How important is it for you to break through those three time thresholds and what are your goals as far as times, medals and championships? SR When I first ran two flat, four flat and fifteen flat a few years ago, I thought it was no big deal that I was just over those marks and that they would come naturally in my progression. It isn’t always easy to get a race that is set up to run fast, but it is time for me to break some of those times. I would like to reclaim my title at the U.S. Olympic Trials and that is a big goal for me. Another goal I’ve been striving for this year is to be on the medal podium in London. GCR: Running is your sport, but it is also a job that will only last for a limited number of years. Would you like to be involved in the sport once your competitive days have ended or do you see yourself pursuing a career that involves your collegiate studies in theater and film? SR I will never get too far away from the running community in San Francisco, but I am excited to explore different avenues in life which I haven’t explored yet. GCR: You have been recognized for your running achievements many times including being inducted into the San Francisco Prep Hall of Fame and Sacramento Meet of Champions Hall of Fame. How rewarding is it to be so honored for your hard work and accomplishments? SR It is very cool! I still feel like I have a lot more to do and areas where I want to prove myself. Right now I’m focused on that so hopefully I can achieve more of my goals before I end my running career and I may be recognized by a few more organizations. SR It’s really important to think long term. If you do so it hopefully will allow you to not go too crazy in the present. High school is four years, college is another four to five years and you can run for many years after college so runners should try to be patient and improve a little each year. That is what I always strived for. Runners shouldn’t try to move too fast to get to a top level but should aim for it over a longer period. GCR: Are there any major lessons you have learned during your life from balancing academics and athletics, the discipline of running, racing success and adversity you have encountered that you would like to share with my readers? SR When I speak at high schools or colleges I like to speak about overcoming obstacles. I’ve been fortunate to have some great successes in my career, but many have come after some really challenging moments. In order to overcome challenges and to reach goals we must concentrate on moving forward and not allow ourselves to think that we can’t reach goals. No matter what the situation or how frustrated you may feel, give yourself a day to feel upset, but as soon as the day is over make a plan to move forward.